By Eric Abrahamsen, published August 25, 2016, 11:30p.m. 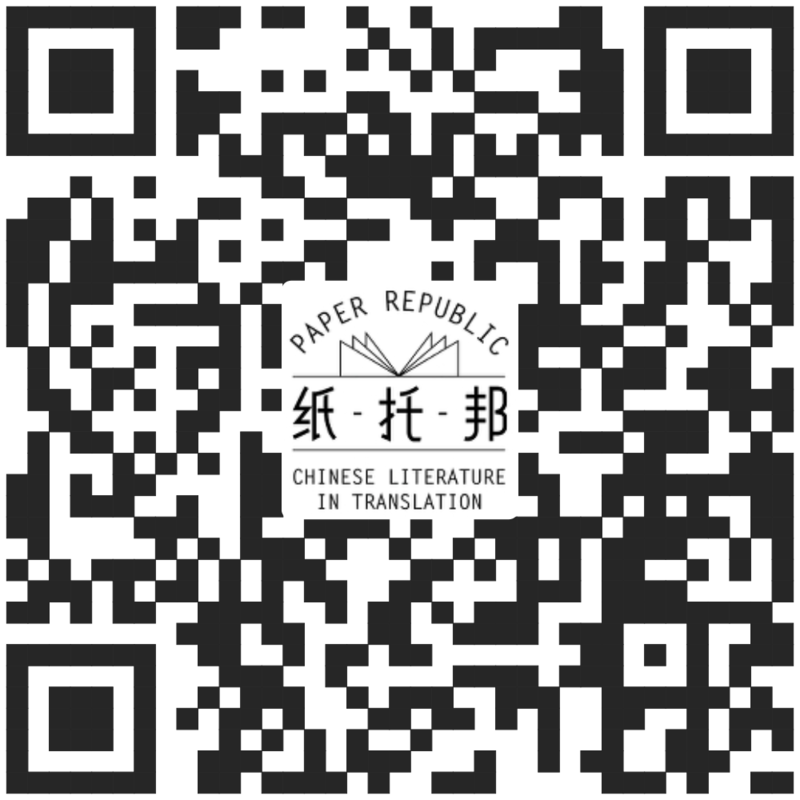 So we're about halfway through our program of literary events surrounding the 2016 Beijing International Book Fair, which so far has been great fun. Last year, the first year Paper Republic did these "Literary Salons", we were too exhausted to post about this at all, let alone halfway through the program, so I suppose this is progress! To me, it's clear what "progress" consists of: more hands on deck. Last year it was just Dongmei and me; this year we've added Min Jie as our third PR employee, and have a team of three awesome interns, Lirong, Yutong, and Mingjun. The whole thing is much more under control, and it's possible to actually enjoy ourselves! Putting Alejandro Zambra, the Chilean cultural attaché, and the Chilean ambassador on a stage which, several weeks after we booked it, was turned into part of the children's book zone. The three of them discussed Chilean history and literature against a Finding Nemo backdrop, while the audience sat on colorful little squishy Tic-Tac stools. Zambra is a good sport. 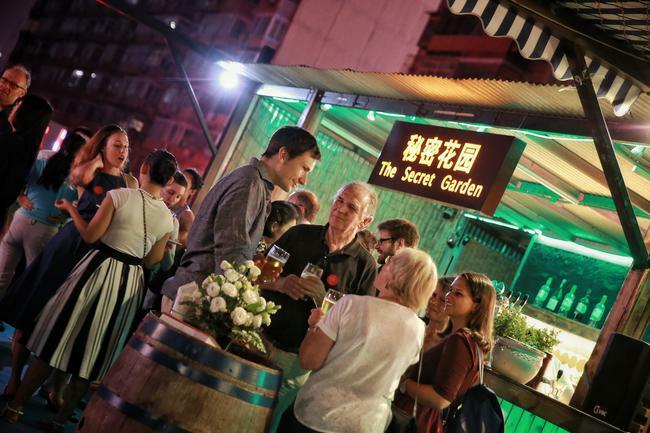 A cocktail party at the Beijing Bookworm. The Bookworm of course runs their international literary festival every March, a much larger and more long-running event than what we're doing here. But the two things are complimentary in spirit, and I'm really glad we were able to work together for the fun part of this week. Acting as impromptu bodyguard for Nobel laureate Svetlana Alexievich yesterday. 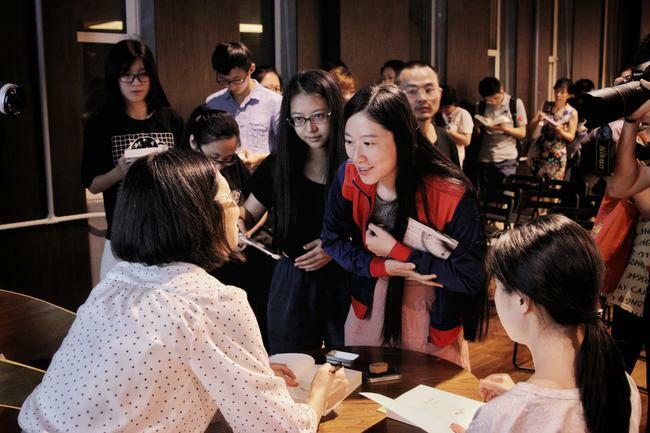 Most audience members at the fairground were well-behaved, but a handful had obviously come because – hell or high water – they were going to get a Nobel laureate's signature, even if they had to tackle her. I wasn't expecting tussling to be a part of our literary festival, but hey, it was exciting. 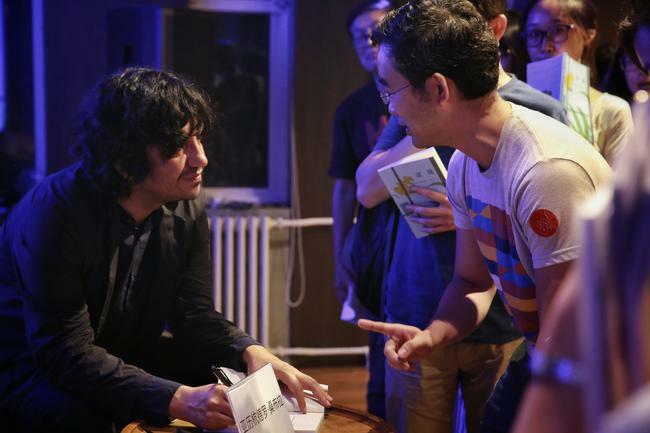 Another of your events, Alejandro Zambra and Xu Zechen in conversation at the Cervantes Institute was fun too. The venue was excellent, spanking new building with a big sitting-out area outside and all the staff very friendly, and when the conversation began, there was simultaneous interpreting through proper headsets for those as wanted it. The focus was fair and square on Zambra, apart from a slightly puzzling attempt by the chair to draw parallels between the two countries' literature based on a common theme of earthquakes. I would have been interested to hear Zambra's comments on Xu Zechen's writing, but there's a limit to how many insights you're going to get in an hour and a half. Actually the most discussion-worthy comment came right at the end: Xu Zechen said that he felt Zambra's writing was a bit poetical and he hoped to see Zambra write something more 结结实实的, sort of "solid", less airy-fairy? in the future. I wanted to hear XZC explain himself, and Zambra's reaction to this! But we were out of time and all got free glasses Chilean wine instead. Nicky Harman, August 26, 2016, 1:09a.m. susan, August 26, 2016, 10:12a.m. Manuel Pavon, September 13, 2016, 2:13p.m.